Rated as one of the top tourist destinations in the world, South Africa holidays are amoung the best you can get. With a diverse range of natural splendor, travelers can choose between any and every type of terrain or ecosystem. One of the greatest perks of living in this stunning place? Being a tourist in your own country. Knowing the local spots, here are some places to see that won’t break the bank. When you are working on a budget, wanting to enjoy your time off while still being financially sound when you return, it is best to find the hidden gems and local favourites. Travel the country without becoming part of the urban broke – In search of getting the best for less, we have put together a list of some must see places around South Africa, all at an affordable rate. A beach-side camp site, some 160km outside of Cape Town, Tieties Baai is a must see destination on your South Africa holiday. Just outside the quaint town of Paternoster, Tieties Baai is a fantastic place to go and camp under the stars. Overlooking a small cove of crystal clear water, with camp sites running around the small bay, this camp is known for its snow white beach sand and towering sand dunes. Offering unbelievable vantage points, there is something spectacular about sitting on the highest dune at night, looking out over the sea, taking in the endless stars above you and the lighthouse in the distance. From around R141 per night for a six person camp site, this is an affordable holiday maker’s dream that won’t disappoint. Tucked away on the banks of the famed Orange River, Fiddlers Creek is said to be the ultimate in river-side camping. Allowing for perfect privacy, with each site being enclosed by a reed fence, these cater to intimate occasions with an undercover kitchen area, washing up basins, lights and power as well as a braai area. Perfect for getting out of town for a while, enjoying the raw beauty of Africa, this is certainly one of our suggested destinations. With a communal area offering a bar and bar-style activities, as well as outdoor sports areas, this is a fantastic stop on any South Africa holiday. From just R80 per person per night, this is a cost-effective way to see the shimmering waters of the Orange River. 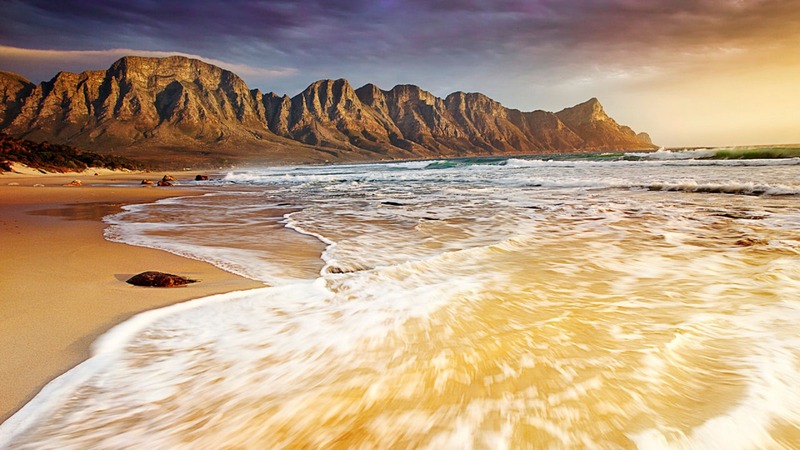 One of the most breathtaking area in South Africa, a region that has inspired fables since the early days of the Cape Colony if not since before, the Storms River Mouth runs along one of the most beautiful coastlines in South Africa. A must see on your South Africa holiday, with the camp site located right on the sea shore, this area offers an unbeatable experience. With towering hills and endless forests behind you, and an open stretch of pristine coastal waters in front of you, this is definitely a place not to be missed. From R370 per couple, this makes for one of the best romantic getaway camps around. Located a short 24km outside of Pietermaritzburg, Albert Falls Dam and Game Reserve offers a picturesque setting and a most amazing and noteworthy sunset. The perfect getaway for keen fishermen and adventure enthusiasts, this 3000 hectare region is perfect for indulging your wild side. With water sports, excellent bass fishing and around 110 campsite options, this is a fantastic way to get out of the city for a while. A stunning way to enjoy your South Africa holidays, surrounded by the glistening dam and clear, open sky, this is a beautiful place where you can kick your shoes off and relax. Camping goes for around R100 per person, per night. A short two hours’ drive from the mother City, Beverlac is situated on the outskirts of the Cederburg region. A stunning area renowned for ancient cave paintings and some of the best night sky viewing around, the Cederburg is ideal for anyone wanting to get away from the city and see the wilderness in all its glory. An adventurous getaway, this region offers endless walking and hiking trails, trailing off into the towering clay-coloured rocks that form this stunning mountain range. With a series of rock pools that are some of the main attractions to the area, this is a wonderful place to hike out for a day and enjoy the cool water underneath the beating African sun. A great part of South Africa holidays, the campsite in the area is pet-friendly and wonderfully maintained, giving your comfort under the stars. With camp site prices at around R55 per person, per night, and an added R50 per pet, this is a cost-effective holiday option that lets you explore the endless natural wonder of the area.